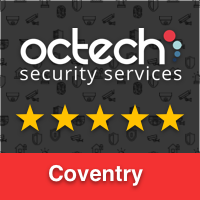 Octech Security Services is a professional electronic security installer based in Warwickshire. We have many customers in Coventry who we have provided a range of security systems for. Our services include the installation, repair and service of Burglar Alarm Systems, CCTV and Access Control. If you are looking for home security in Coventry, why not give our friendly team a call and find out how we help.